Kununurra, WA. 7th September 2015. 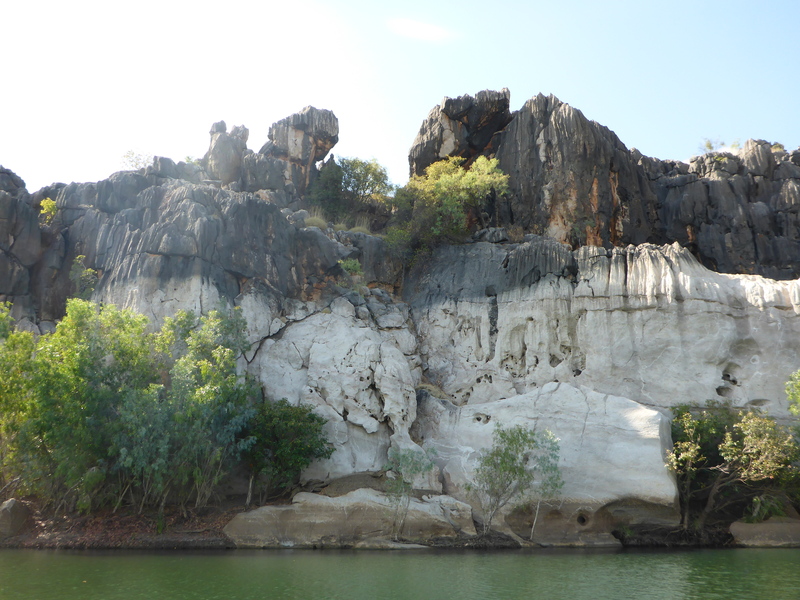 Kununurra bills itself as the eastern gateway to the Kimberley Region. This region is a highlight of any visit to the north of Western Australia because of its plethora of gorges, waterfalls, flora and fauna, and general abundance of nice things to see. Plenty to visit and be amazed by, although most of its treasures are down dirt roads. Chief among these is the Gibb River Road. 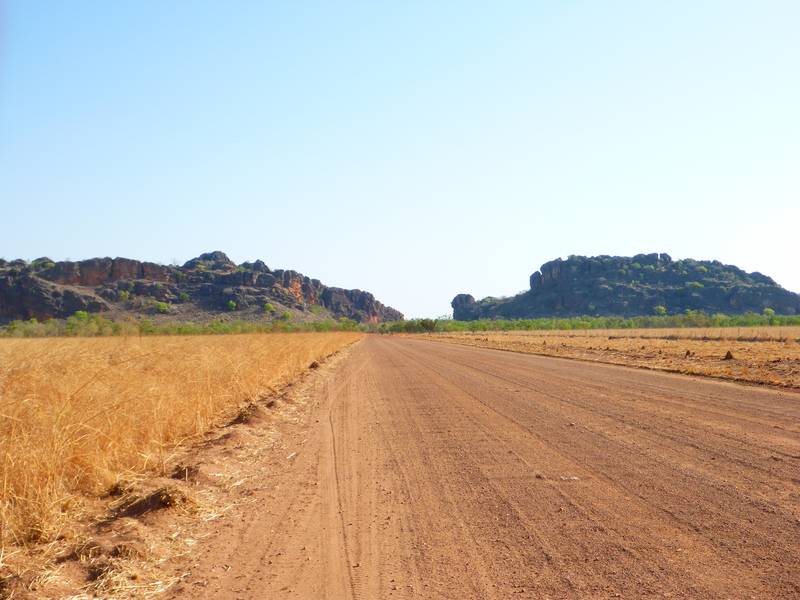 Running from near Kununurra, the road takes you west and south to the town of Derby, which lies on the coast. The geography is very similar to Australia’s Red Centre, which I’d just left. That means very dry winters and very wet summers. It also means over 600kms of dirt, in varying states of repair, depending on when the grader last came through, and no shortage of red dust. It goes near, or through, two mountain ranges – the Leopold and the Cockburn. 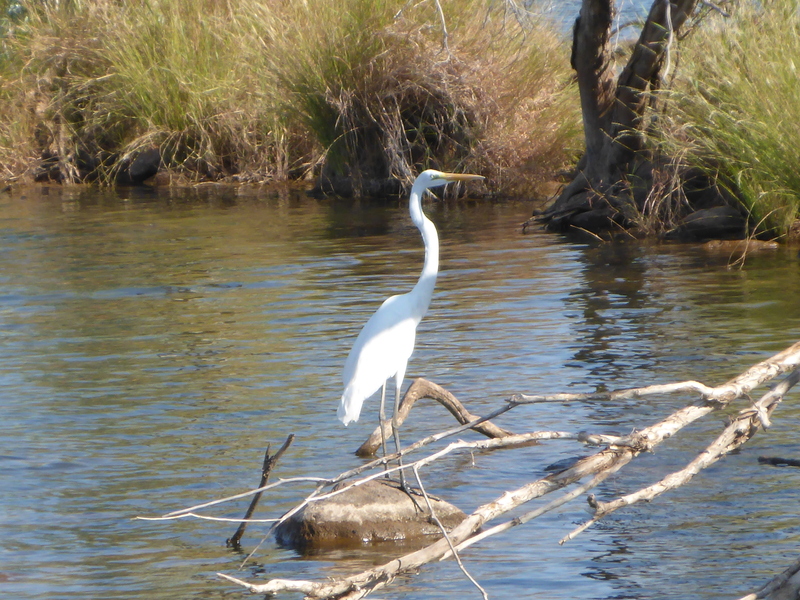 Hence the reason for plentiful opportunities to walk a gorge, swim in a waterhole or even relax in hot thermal springs. The road was constructed to enable road trains to move cattle from the various stations in the area to the ports of Wyndham and Derby. It was this change in the strategy of cattle movement that led to the closure of the Canning Stock Route. That route is another on the list headed ‘Iconic’, a list that seems to be quite long, I’m pleased to say. Good news on the weather front. I didn’t rush too much when I left the hostel. 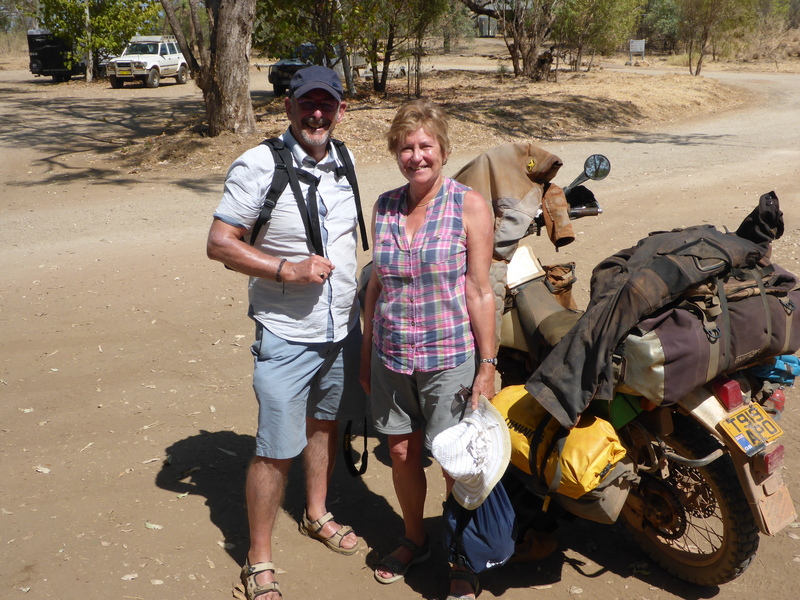 I didn’t have too far to go to get to El Questro Station, my first overnight stop. From here there is access to several gorges and some hot springs. 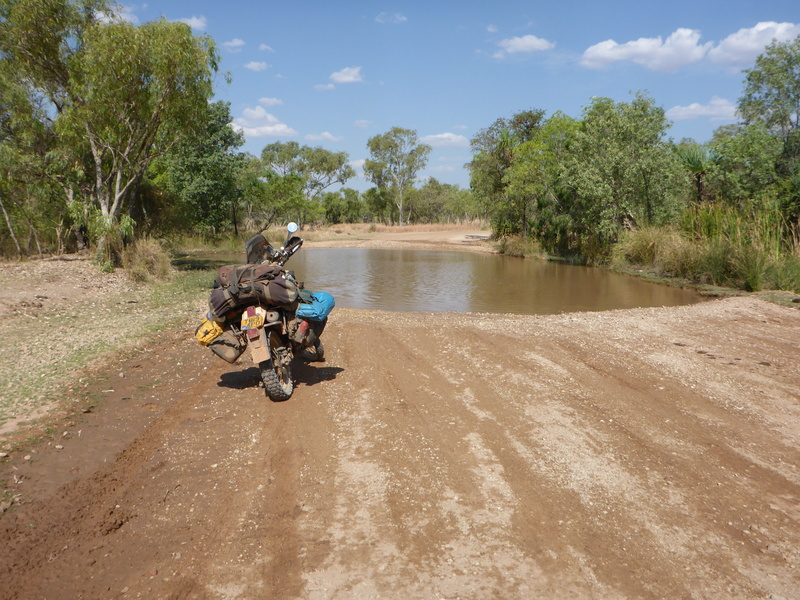 The ride in from the GBR took me across the Pentecost River, via a very stony ford. It wasn’t all that deep but the problem with stones is how to tackle them. Go for it, and risk hitting a large rock? Or very slowly, with the chance of getting stuck in a hole? I took the latter option and had to power my way out a couple of times. Luckily it didn’t take long to put my tent up and leave my wet boots out to dry. It was too hot to do too much until later in the afternoon, when I went for a walk up to the nearby lookout on Telegraph Hill. It was very pleasant watching the birds of prey wheeling around on the thermals, looking for their next meal, as the sun set. 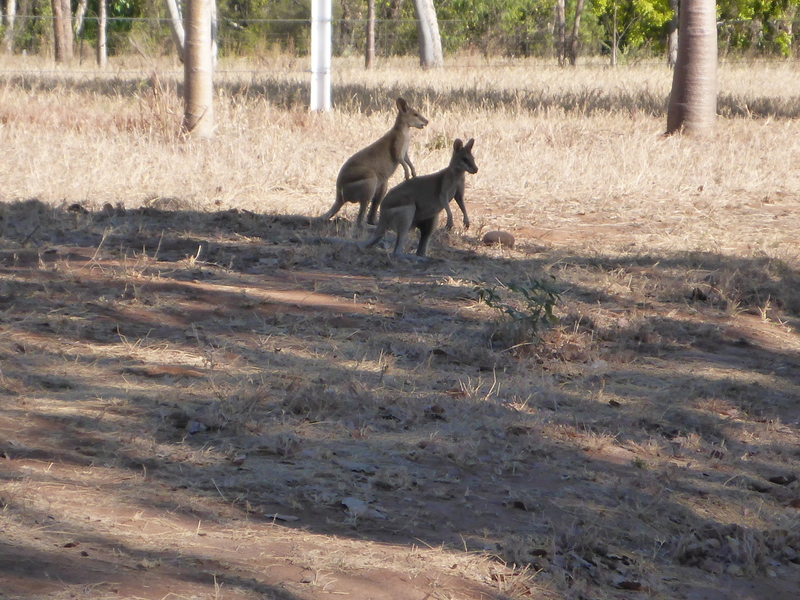 ‘Roos in the evening shadows. I got up early and headed out to walk some gorges. 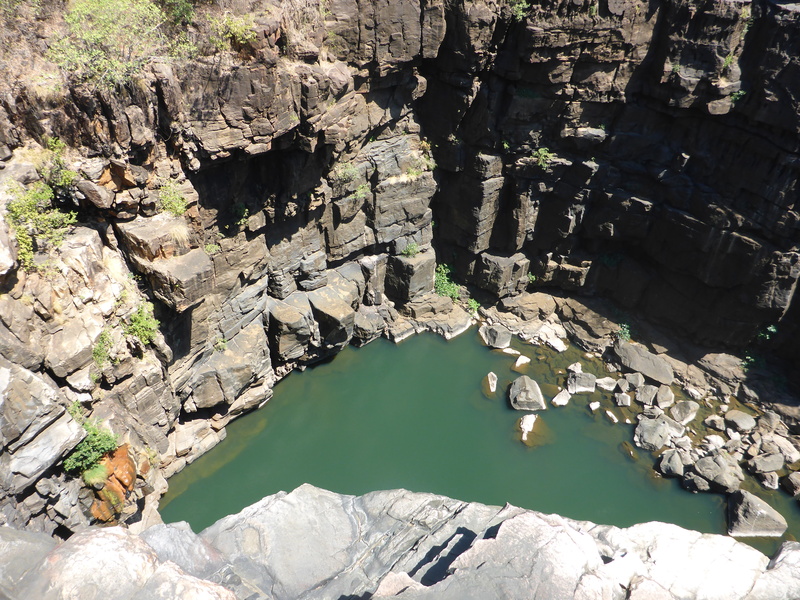 Moonshine Gorge and El Questro Gorge were on my list, hopefully to be followed by a dip in the Zebidee thermal pools. Moonshine Gorge was quite a tough walk, of about 7kms. The track from the car park went up onto a ridge, then down to the creek which runs through the gorge. It was very stony in places and the path by the creek involved lots of scrambling over boulders. It was tough going and it was lucky that the path had been marked out well as it crossed and recrossed the creek several times. The info boards always suggest a likely time for completing the route. I always try to beat it by as much as I can, just because I enjoy the exercise and the challenge. 2.5 to 3 hours is recommended. I walked it in 1:30. And that was without rushing, because you can’t. One other frustrating aspect is that you can hear such amazing birdsong but rarely see the birds, hidden away in the foliage. When you do, you discover that they are as beautiful as the songs they sing. 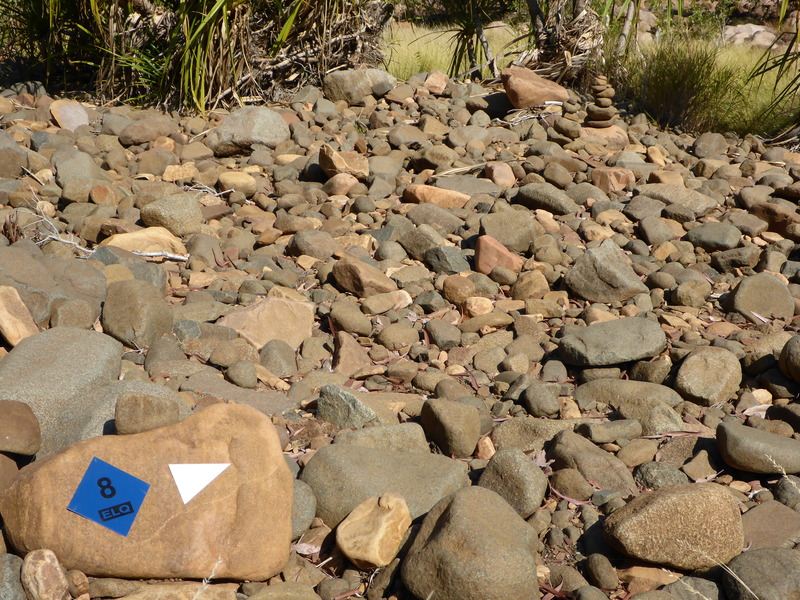 Well marked trail, but rough ……. …… leading up the creek into Moonshine Gorge. At El Questro Gorge I didn’t go right to the end. That would have involved climbing over and around huge boulders and would have taken too long. This walk went close to the creek the whole time and the challenge was more to do with staying upright over slippery stones. Because of the nature of the gorge and the ever running creek, there were different plants and trees here compared to outside. Livonia Palms were the most obvious, along with Ferns and other typical damp area plants. It’s very easy for micro climates to exist in these hidden places, and to see flora and fauna that simply aren’t there a few hundred metres away. Often there’ll be plants that only grow in one small area too. 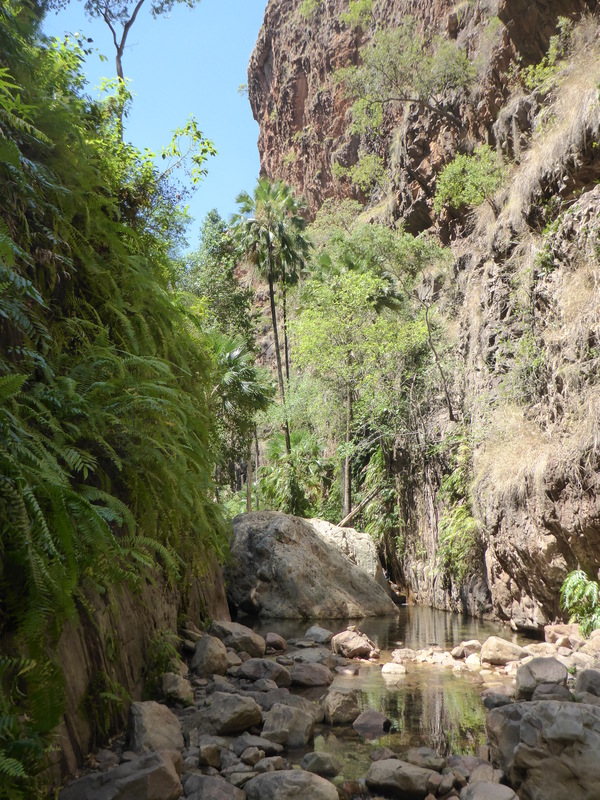 Up into El Questro Gorge. Zebidee Pools is only open in the morning, shutting at 12:00. This is to reduce the wear and tear on the roots of the palms which surround the pools, which would suffer severe damage otherwise. So I had a nice, warm twenty minutes before the ranger came to shut us out. 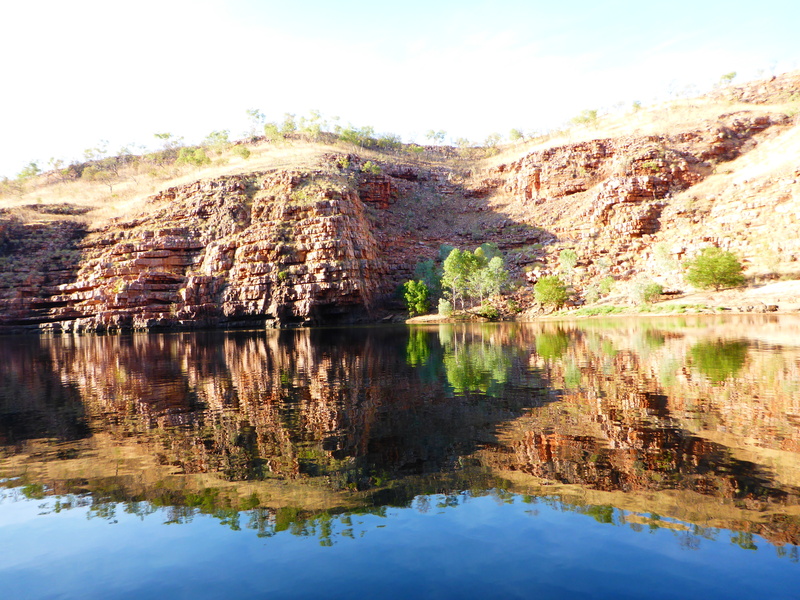 For the afternoon I’d booked a 4×4 drive out to Explosion Gorge, with a boat trip and sunset viewing to round it off. We left just after 2pm and Lew, our driver/guide, explained about the ownership of the station over the years. The original one million acre station has been broken up. 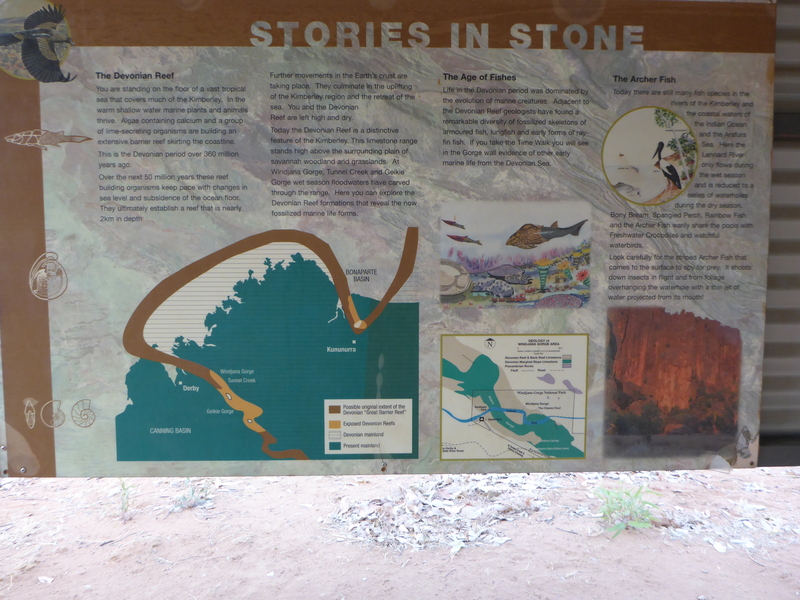 Some of it is El Questro resort, some a cattle station and some part of the NP. The resort is now American owned, one of many around the world, it seems. Lew talked to us about how high the rivers can go in the Wet, pointing at a previous flood level, easily 15 or 20 metres above the current river level. I find it puzzling that less than a metre of annual rainfall can have so much effect but it’s simply because the ground won’t absorb very much of it so all the water runs down to the rivers. The sandstone rock absorbs a lot, then releases it slowly, and that is why many of the rivers have water in them all year. A collection of large Boabs, and our chariot. 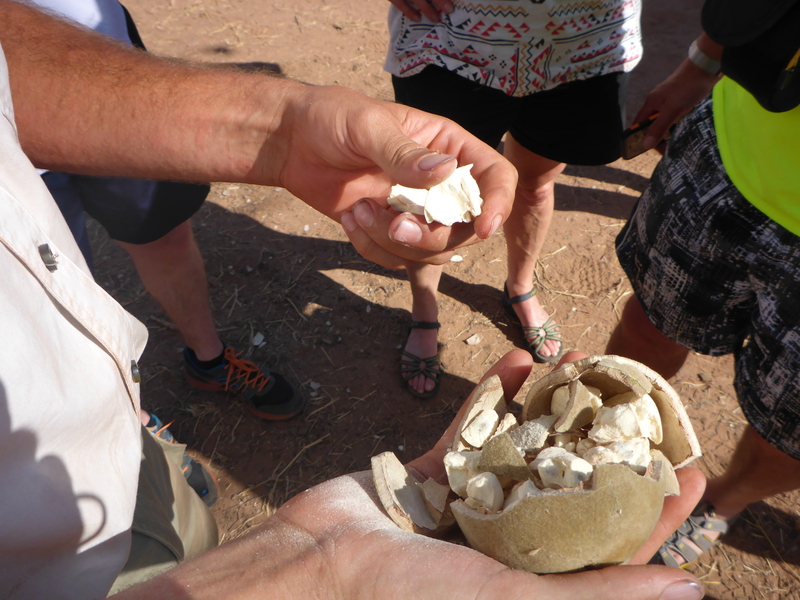 We stopped by a Boab tree and Lew found a seed pod which he broke open for us. The white powder inside contains a very high level of vitamin C and is also very good for keeping teeth white. But the seeds inside it give you diarrhea! Inside a Boab seed pod. Plenty of vitamin C and it tastes like lemon too. Don’t eat the seeds or you’ll be needing a cork! The land surrounding Explosion Gorge has not been affected by the uplift in the Earth’s surface, which has affected other areas. So the layers of different rock in the sandstone cliffs are almost horizontal. As we made our way serenely down the gorge Lew would point out previous flood levels, etched onto the cliff face, and some of the geological features. I’m always impressed by how knowledgeable the guides are. They almost never get stuck for an answer. The boat was electric, an absolute must for sensitive eco areas like this. After that pleasant ride we were taken up to Branko’s Lookout where we could see right across the Pentecost and Salmond river valleys. Of course these valleys have sandstone cliffs and of course the setting sun gave us magical colour changing scenes to enjoy while we sipped a cold drink and ate cheese and biscuits. What a civilised end to a day. Looking down the Pentecost River as the sun sets. 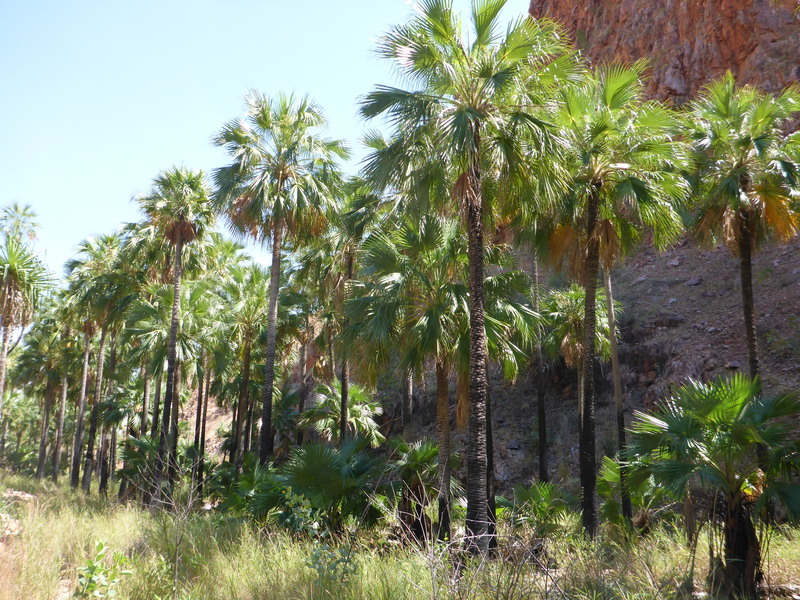 El Questro has more to offer but I believed I’d seen the best and felt it was time to move on. 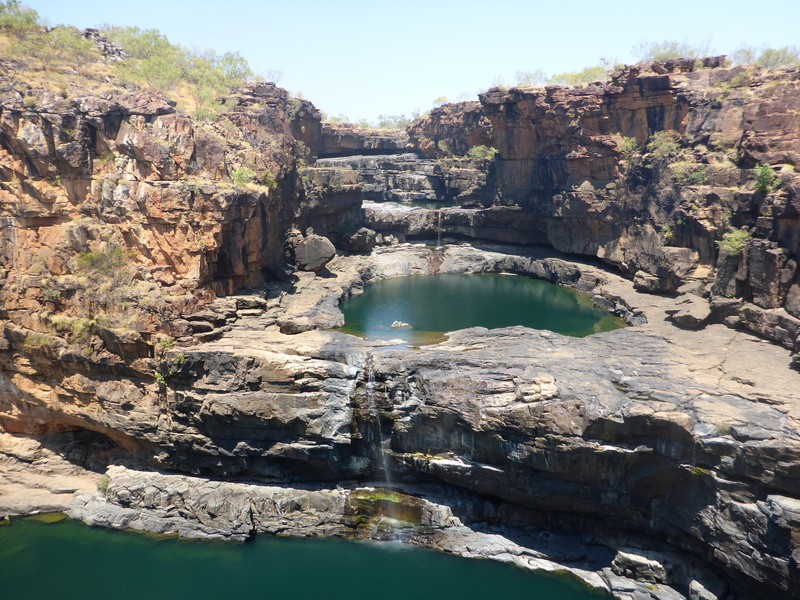 My next destination was the Mitchell Plateau, where I was going to visit the spectacular Mitchell Falls. Unfortunately they aren’t quite as spectacular this time of year, at the end of the Dry. I was told there would be some water flowing over them but not much, and also that the visit would be worthwhile anyway because the whole set up is pretty impressive. I hoped this would be true because I’d also been told that the access road was spectacularly rough. Lots of spectaculars, not so many particulars. Time to find out. 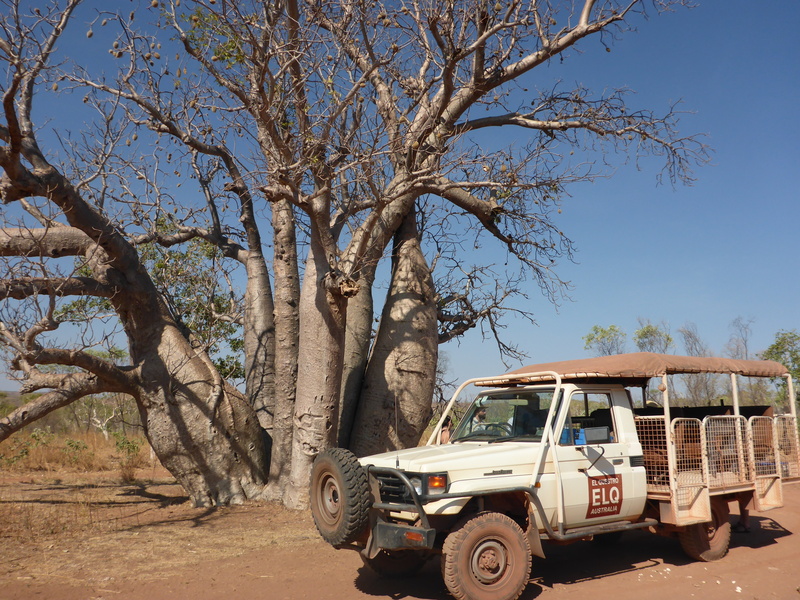 Getting to El Questro across a stony ford. 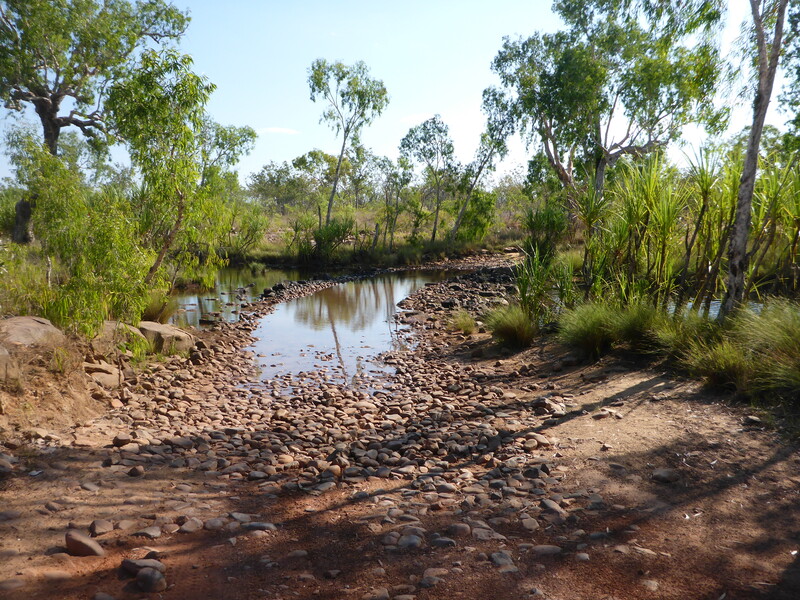 I crossed the Pentecost River for the fourth time, this time with far more confidence and much drier feet. Once back on the Gibb River Road, and heading west, I made good time to the turn off to the north that I needed. The road is mostly well graded but there are always heavily corrugated sections to suffer and sometimes patches of the dreaded deep sand. The Kalumburu Road goes north for over 260kms to the Aboriginal township of the same name, situated close to the coast. It would have been interesting to visit there but it required two different permits, one of which has to be obtained from Perth. Definitely not a scenario that’s compatible with my spur of the moment planning technique. So I rode up to Drysdale Station, filled up with petrol and coffee, and carried on to the Mitchell Plateau turn off. Seventy two kilometres later, after riding easily the roughest road I’ve been on so far, my brain seemed to have turned to mush because I misread the sign at the left turn that would have taken me the last 16kms to the falls and the camp site. Instead I rode further along the road until it was obvious I was going to have to find a bush camp as the sun was very low. I went a short way up a track leading to a water cistern, and put my tent up next to it. For the first time I was camping on ground that was so hard I couldn’t get my tent pegs into it. Sensibly, I’d bought a tent that could be used without them. Geological make up of the Mtchell Plateau. I got down to the visitors’ car park fairly early next morning, before the heat had risen too much. I set off to walk out to the falls. Not difficult at first but soon the well marked trail had me scrambling over rocks and round boulders. It was well worth the effort though. Little Mertens Falls comes first. Hardly any water flowing but they are far from little, with a long drop into a deep pool. Next to them is a nice lilly pool and it looked very refreshing. Onwards to the main event. 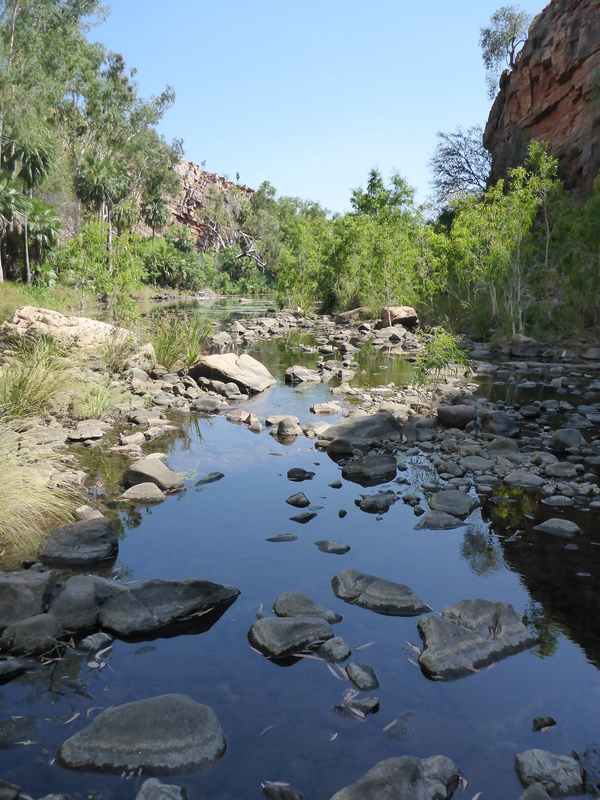 The Mitchell River is very wide just above the falls and is easy to cross in the Dry. There is a heli-pad on the far side so you can walk out and get flown back, if you want to and can afford it. I didn’t and couldn’t. The pool the Little Mertens Falls drops into. The best view of the falls is from the cliffs on the far side so I crossed the river and made my way along them until I was able to look down and across at the falls and the huge pool at the bottom. It isn’t possible to get down to the bottom of the cliffs but the view across was still very good. It would have been magnificent had there been a good flow of water but even with the small amount there was, their majesty was easy to discern. They have four tiers, getting wider as they drop down into the turquoise pool at their base. The river then flows out through a gorge to the sea. It is, the signs said, a popular place for crocs. OK, point taken. The very wide, but almost dry, Mitchell River. The Heli-pad is on the other side. I’d enjoyed the 9km walk although it was definitely getting very warm by the time I got back. I’d taken two litres of water and drank all of it. The heat is deceptive and there really is a risk of dehydration and heat exhaustion. You ignore the warnings at your peril. But it had all been worth it because the falls look great, even with very little water. 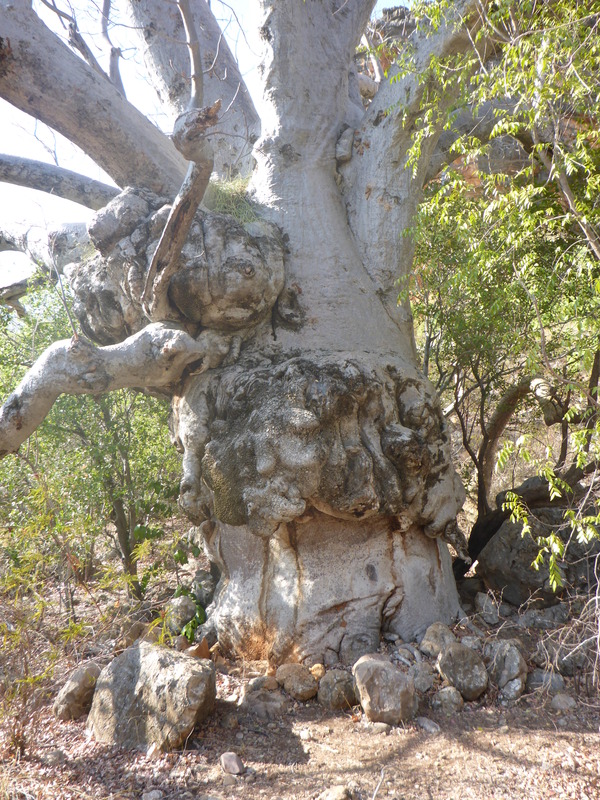 The best time to visit is early in the dry season when they would look simply magnificent. Four tier waterfalls. Shame about the lack of water. After eating my snack, while sitting in the shade, I put on my far-too-warm riding gear and set off to tackle the road out. To be fair, the first part, taking me back to the main access road, isn’t too bad because although rough, it’s also challenging. Its surface is rocky and stony and it twists around, with some steep climbs too. That is a good trail riding challenge so is enjoyable. But when I got back onto the main access road I was back to the huge corrugations, cross ruts and unforgiving surface I’d had to endure on the way in, with no respite. Most definitely not fun. Ninety kilometres and two hours of riding, mostly at 30-40kph. 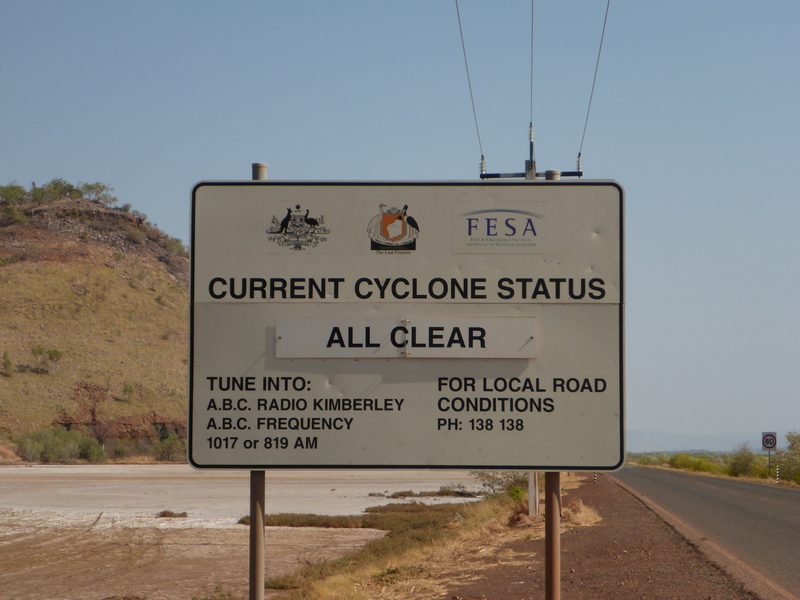 By the time I reached the main Kulumburu road, and turned south for Drysdale Station, I was exhausted. I turned up the gas a bit because the shop there closed at 5pm and I wanted to get fuel. On the way down my rev counter started acting up, reading far higher than it should. After a while I remembered why that happens and sure enough, when I pulled up at the petrol pump at Drysdale, I had no electrics. The main fuse had blown. Sometimes I manage to get things right and one of my sensible decisions had been to retro-fit a kick starter just in case something went wrong with the electrics. So I was able to restart the bike and get onto the camp site, with plans to fix it in the morning. Well done Suzuki for making a bike where I could do that (the kick starter is no longer fitted to electric start models) and also one where the ignition system works without a battery. Before leaving in the morning I replaced the blown fuse, although there wasn’t any obvious reason for its failure. The bracket which held on the controls for my heated handlebar grips had broken off. That would have to wait. The indicators wouldn’t flash. Who cares on a dirt road? The circlip that secures my front sprocket had disappeared so I fitted the spare. Such is the effect of super rough roads on my poor little bike. Bike, sand luggage, leg. They all seem to have got mixed up, somehow. All good to go, so I set off for Windjana Gorge, about 375kms of dirt road and another good sized step westwards along the Gibb River Road. My return ride up to Mitchell Falls had increased my confidence on the dirt roads. Where I used to slow down a bit, ‘just in case’, I was now keeping the throttle open and just powering through the rough patches. 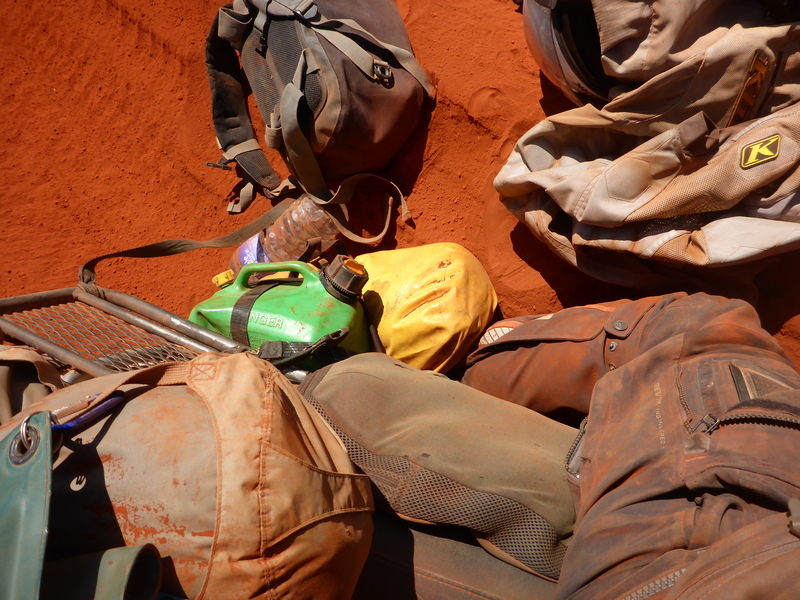 Unfortunately I’d forgotten about sand so, needless to say, when I came to a 100 metre long section of red sand, perfectly blended into the red road surface, I was going too quickly to deal with it. It dealt with me instead and in no time at all I was lying down and eating dirt once more. In case you wondered, all sand tastes the same. Once more I was taken back to my time in Mongolia because my left leg was trapped under the pannier with the full weight of the bike on it. My ankle and knee were twisted round a bit, making movement painful. I un-shipped my luggage from the rear rack but it didn’t help. I was trying to use the handlebars and front wheel to twist the bike up and maybe take enough weight off my leg to let me slide it out. No go. Eventually the solution was to get my right leg across the bike to the left side, which enabled me to reach back and dig my foot out of the sand. I was free. And it surprised me that once I’d stood up and eased the strain in my knee it stopped hurting. The only damage from my ‘off’. All this took about fifteen minutes, during which time no vehicles came by. In the ten minutes after I’d got up, four fourbys came past, all stopping to see if I was OK. Well I am now, I thought, but where were you when I needed you! To be honest, I was pleased to have been able to get myself out of trouble once more. These things don’t always happen on popular roads. After a while I got to Mount Barnet Roadhouse and, having refuelled, took the opportunity to clean up a bit and treat myself to a sandwich and coffee. I deserved it. 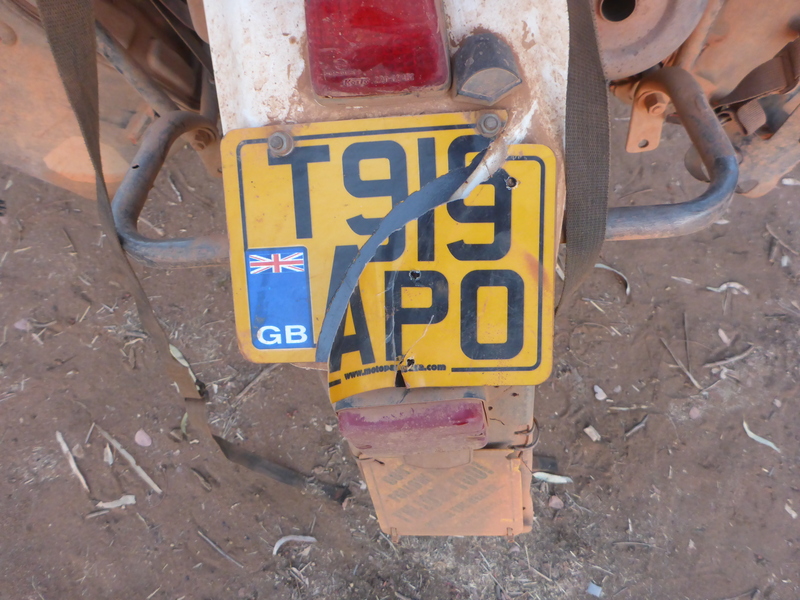 Checking round the bike I found that my number plate had snapped in two, but that was all. Another repair to be done later. There’s a camp site in the Windjana NP and I was there in plenty of time to set up, make tea and glue and screw my number plate back on. I was pleased to find showers here so I was able to remove the red sand and sweat, a very sticky and messy combination. I began to feel better. The Gibb River Road cuts through the Leopold Range. The kind of sign you see out on these tracks. I was out early next morning to walk the gorge before it got too hot. 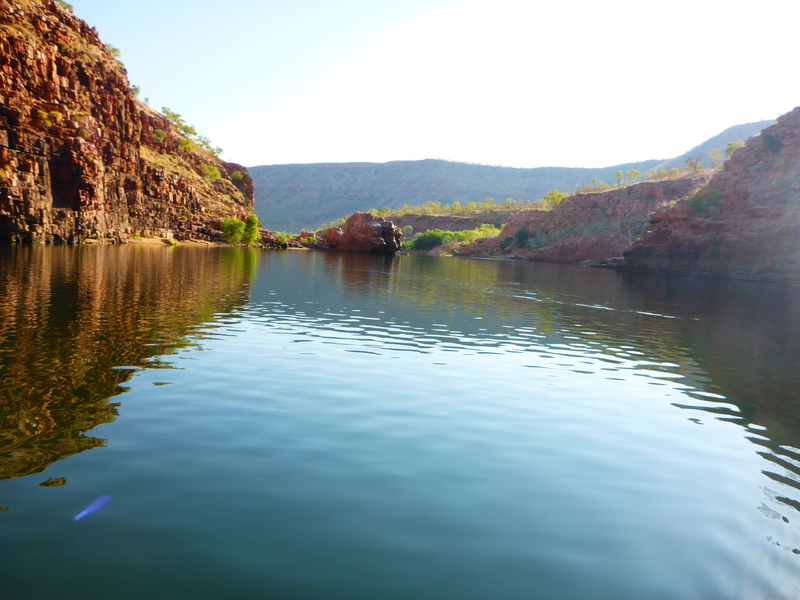 Windjana, I decided, is my favourite gorge so far. It’s different to all the others because the hills are limestone rather than sandstone. Coming along the Gibb River Road, I’d passed through a gap in the Leopold Ranges. These hills are part of an ancient limestone reef. Most of it is buried but here it’s been exposed by earth movement and erosion. The ancient story of the reef. Formed about 360 million years ago, it used to be seabed. So as I walked along the gorge I could sea old shells buried in the rock and other evidence of ancient sea creatures. 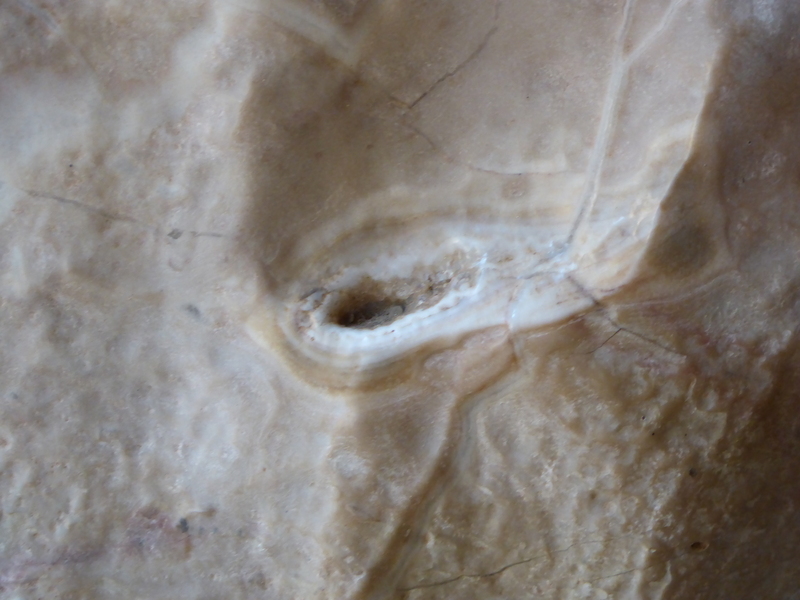 Limestone erodes quite quickly so the rock face was pockmarked with holes, large and small, as well as caves. Although the higher part of the cliffs were the usual iron ore red, the lower parts were white, having been kept clean by the water flow. From the days when land was sea. 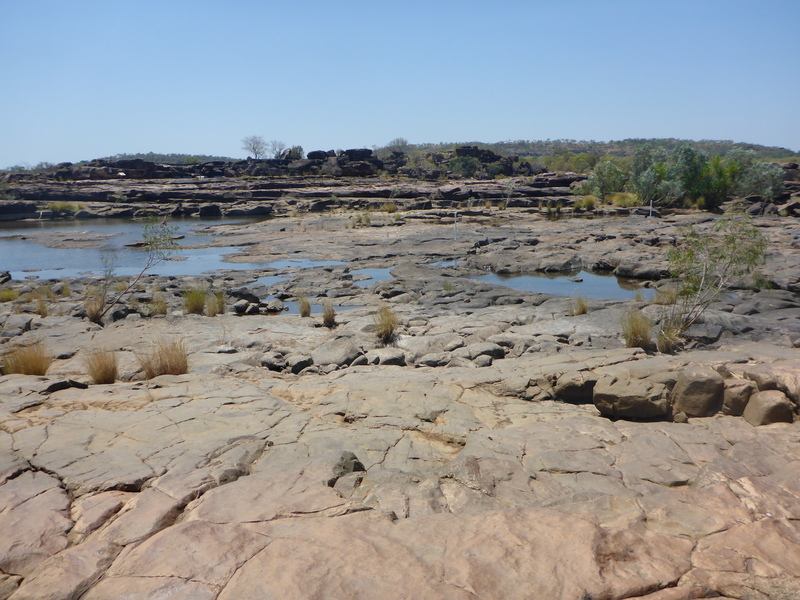 The river was very wide in places and there were a number of isolated pools, some with freshies in them. They get stranded there after the Wet but so do fish and other creatures, so they survive well. On the way back I went over to them and got lots of close up photos. They aren’t dangerous to humans as long as you respect them and, in particular, don’t get between them and the water. The trees and plants in this shady gorge were very green and they reminded me, in many ways, of a country walk in England. I’d become used to seeing only a small variety of trees and not much by way of shrubs and other plants. Here there was a nice variety of mixed trees, shrubs and others, such as creeper vine, all interlaced and wound around each other. A very pleasant change. 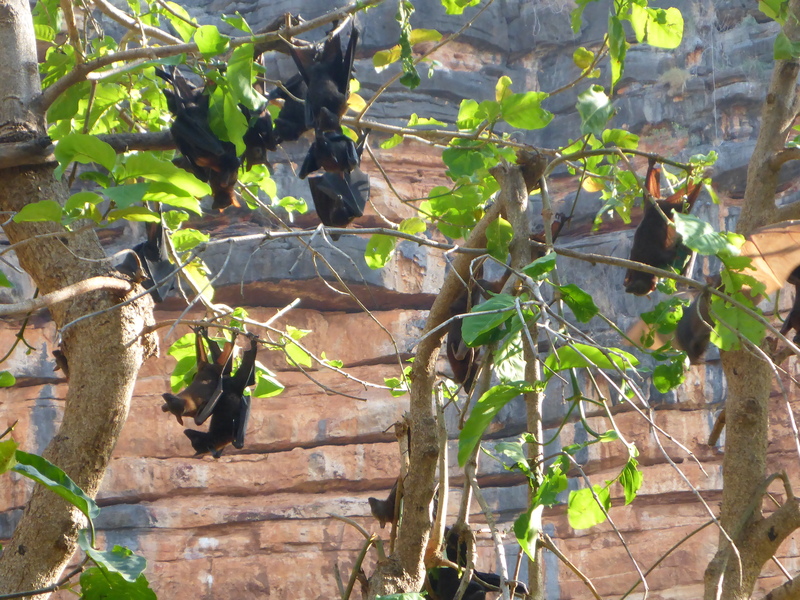 There was a colony of smelly, noisy fruit bats too. I have no idea how they manage to sleep because they’re always getting disturbed and flying around from tree to tree. Fruit bats. They never seem to stay still. There were plenty of birds around, probably more of them because I was out early. It seems to be the case that wherever I go there’s different birdsong to listen to. Always a great pleasure. A really nice walk now completed, I went back to camp, packed away and headed off to my next destination of Tunnel Creek. On the way I called in to look at the ruins of Lilliloomorra police station. 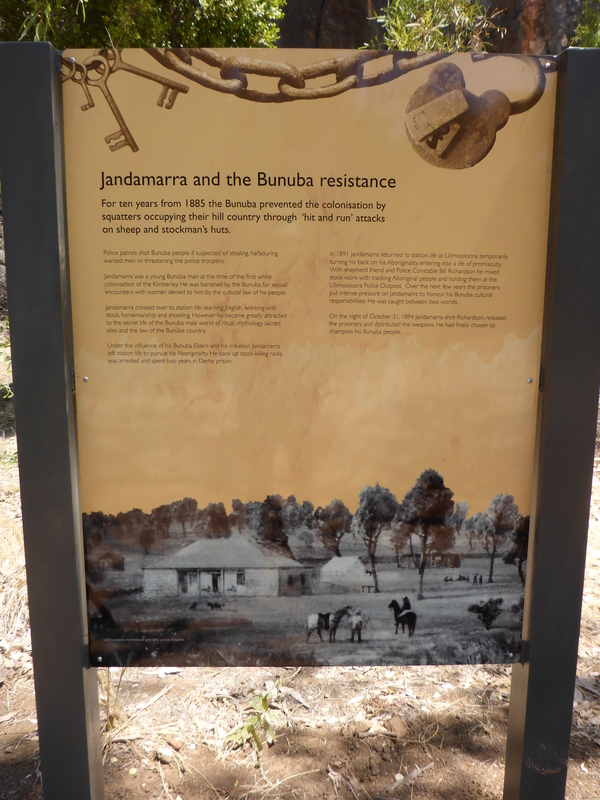 Its place in history was secured when one of the Aboriginal trackers, Jandamarra, ‘went native’ and shot his white colleague. Well worth a read. Follow the link. Tunnel Creek runs through a tunnel in the Limestone. What a surprise! An extreme example of what erosion can do.It’s a spooky place, as you can imagine. You have to take a torch with you and you will end up wading through water during your walk. 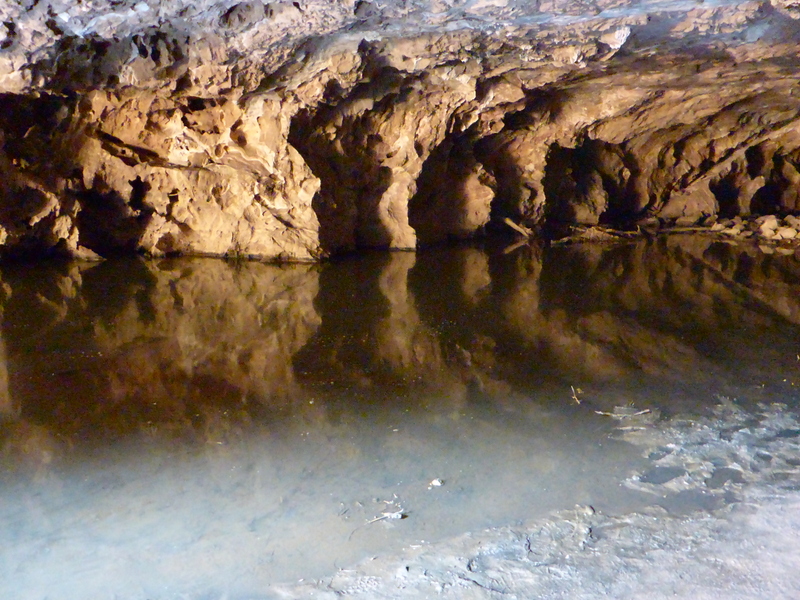 There are bats, stalactites, sandbars, rocks and a croc. A freshie, fortunately. It looked dead, but it wasn’t fooling me! Fortunately the tunnel is wide enough to be able to give it a wide berth. Halfway through there’s a section where the roof has collapsed and daylight and fresh air can get in. So can the smell of the fruitbat colony in the nearby trees. At the far end the creek comes out into daylight and is very pleasant and peaceful as it continues on its way. It’s all very nice and cool so the hot sun feels even worse when you come back out. The sign said the road was open! Not difficult to get across though. Another 70kms of dirt and 45kms of bitumen got me to Fitzroy Crossing and to Fitzroy Lodge, easily the swankiest camp site I’ve been on so far. It’s also a rather expensive hotel/motel and has a nice, cool swimming pool. Once my tent was up I took advantage of it. Hanging around the pool was a bird. A Cookaburra, in fact. 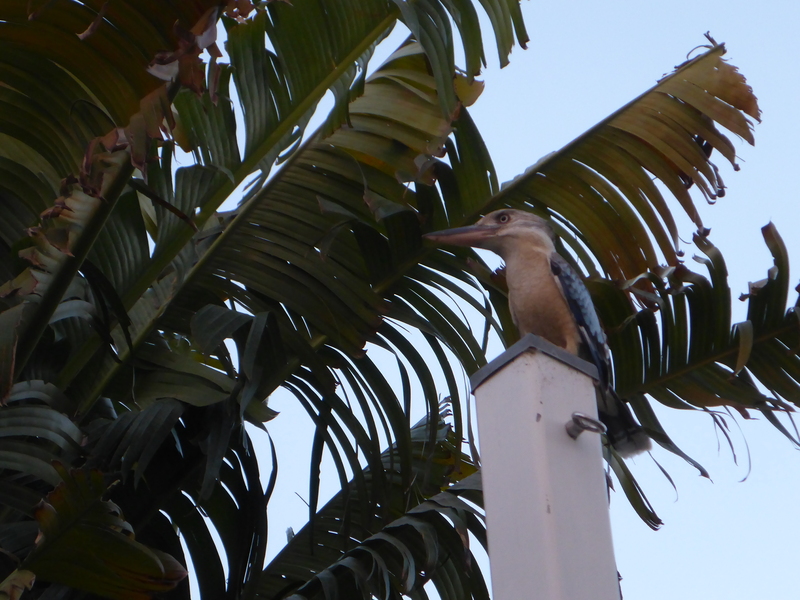 It is a member of the Kingfisher family and looks very much like one too. I also met an English couple, Malcolm and Margaret, from St Albans. 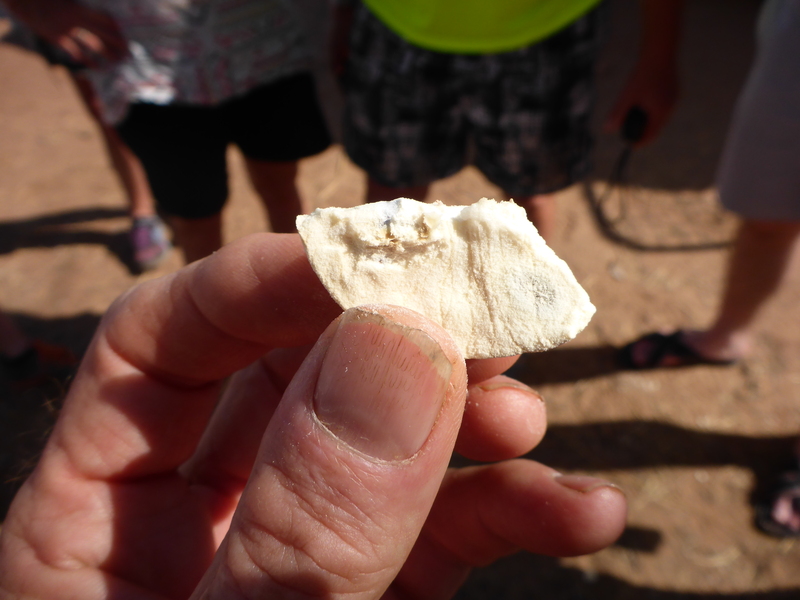 They’re enjoying a holiday and had been to see some of the Gibb River Road’s sights as well. It was very warm that evening and there were a few spots of rain too. But by morning the skies were clear once more and I had plans to explore one last gorge before heading to Broome. 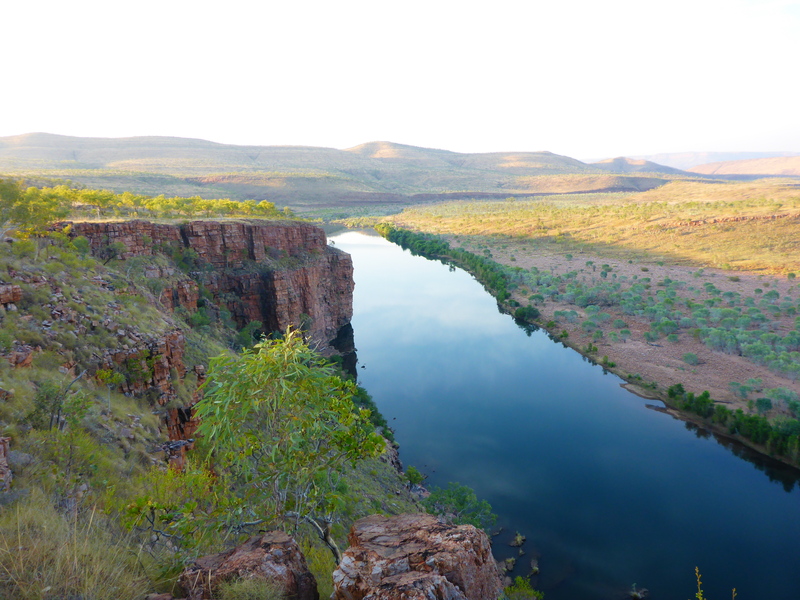 The Fitzroy River runs through the Geike Gorge and I was down there in time for the 08:30 boat cruise down it. Malcolm and Margaret were there too, along with a guide who was showing them around that day. 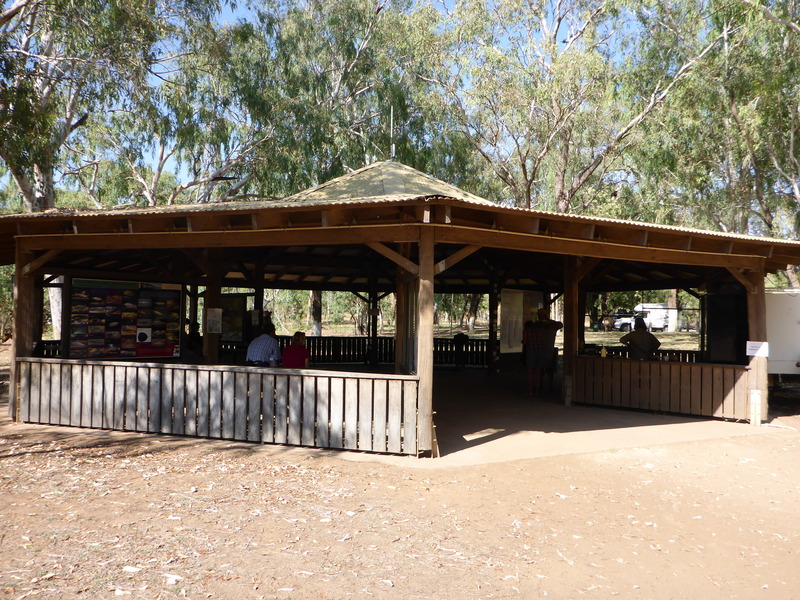 The visitor centre was inside an open sided building which was about five metres high. It was fascinating to see the signs denoting how high up the walls previous flood levels had risen. The highest was two metres above the roof! Our Kiwi Skipper told us that the Fitzroy River has the 3rd or 4th fastest flow of any river in the world at 29,000 litres per second. Wow. That’s a lot of water! The flood plain for this river is 35kms wide in places. Deep and wide, it looked like it would need it. The 2011 flood level was two metres above this roof. Eroded limestone, with high water mark. 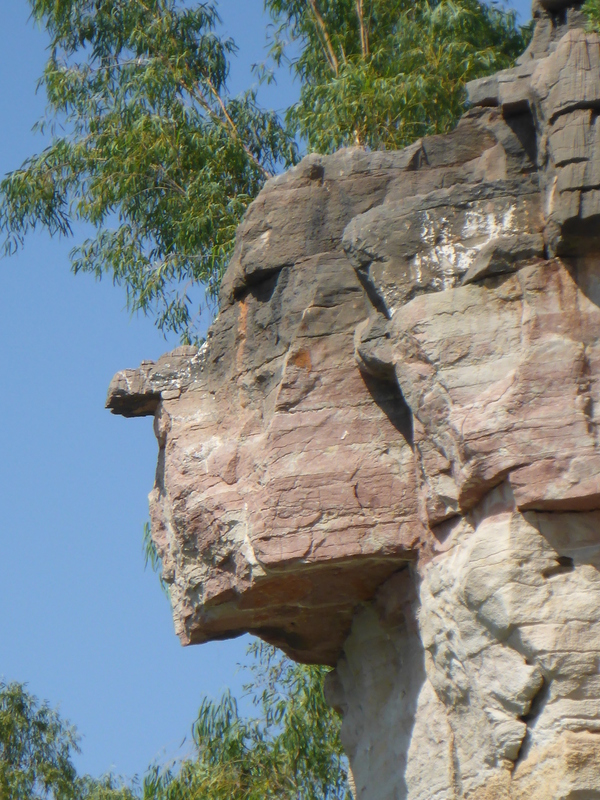 The cruise down the gorge was very pleasant and the limestone rock showed us its many faces. Black and red up above, pale grey at water level. Very obvious water erosion effects. Under some of the overhangs were the nests of bottle swallows. The photo shows why they have that name. There were plenty of interesting rock formations. 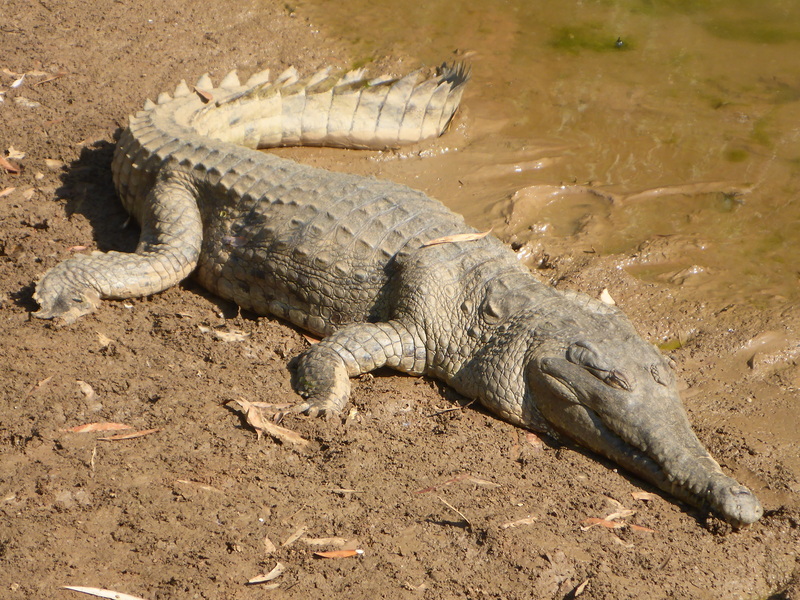 One looked a bit like a croc, another looked a lot like Richard Nixon. A croc and a crook then. The cruise was over soon enough and I exchanged details with M&M before saying goodbye and setting off back to town. At the servo I bumped into Victoria, a roomie from back in Kununurra. She travels around taking blood. Nice to see her again.. By 11am I was on the road to Broome, about five hours riding away. Malcolm and Margaret. A long way from their home in St Albans. As I passed the junction with the road to Tunnel Creek I saw a fourby with some young women standing by it, so I stopped to see what was wrong. Nothing, in fact. They were just pumping their tyres back up after being off road. I saw them again at the roadhouse where I stopped for coffee. Further along the road I saw a Nissan fourby with its bonnet up. I stopped again and this time the young German couple with it did have a problem. Their battery was flat and they told me they’d had to jump start it that morning. I checked the water level and all the cells were dry so I topped them up ad told them to wait a while to see if the battery recovered. If it didn’t they’d have to flag someone down for a jump start. They were going to need a new battery, either way. That little interlude relieved the boredom a bit and I made it to Broome before 5pm. I found the YHA hostel, found that I was in a room by myself so once my gear was unpacked a bit I walked up to the nearby Woolworths for some supplies. Included in these was a selection of cleaning products. Me, my clothes, my riding gear and my bike all needed a damn good scrub up. Everything was full of red dust. It was quite nice to have ginger hair again though. Big, mad Boab tree, on steroids. I’d enjoyed the Gibb River Road and its secret little places. They’d been well worth seeking out. The road itself also had its pleasant side. 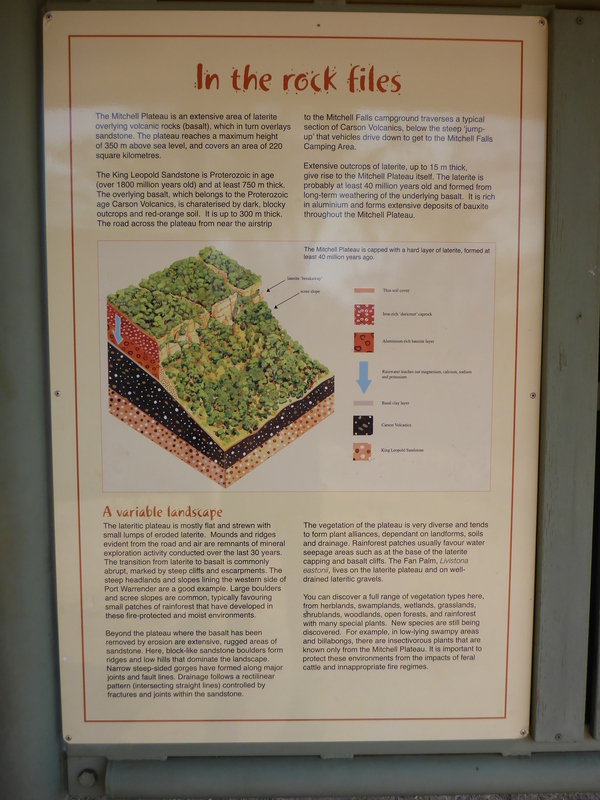 Unlike, for example, the Tanami Track, the GBR crossed some interesting terrain. The hilly sections made the riding more enjoyable and the vegetation changed too, as I headed west. Mostly scrub and spinifex grass at the eastern end, much greener and more pleasant at the western. 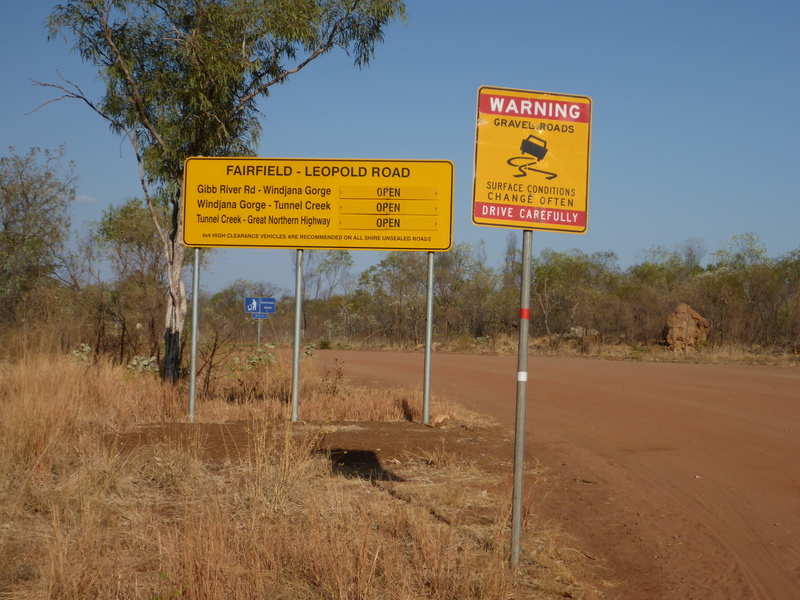 In fact, I didn’t ride the whole length because I’d turned off down Leopold Downs Road to Windjana. But there was only another 120kms before reaching Derby, with nothing to see on the way. I’d been told that Derby itself wasn’t especially interesting so had given it a miss. What’s certain is that if Alice’s charms are somewhat in your face, then Kimberley’s are hidden away but well worth the effort of seeking them out.